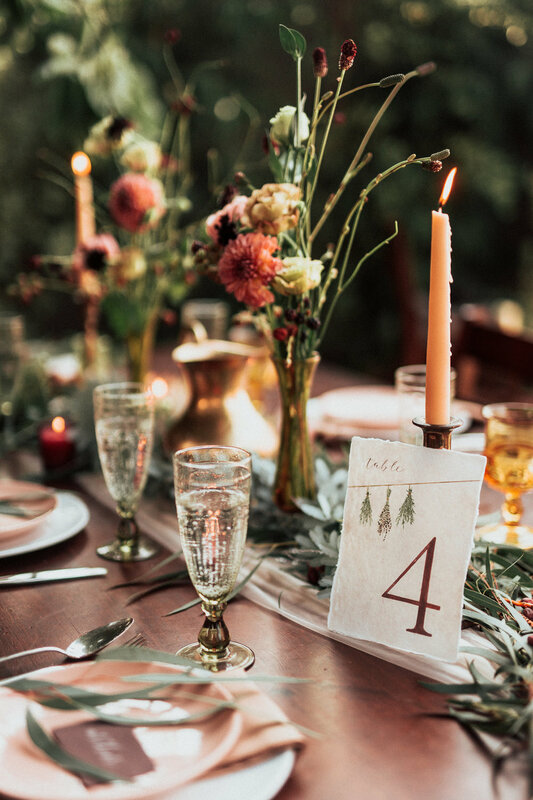 Sneakpeak: Beach Boho Styled Shoot — Wilder Events Co.
Inspiration: Like most of our shoots, we gain inspiration from the couple we're working with! Both are lovers of plants and Mother Nature, often found romping around barefoot in the woods or in a garden/farm. 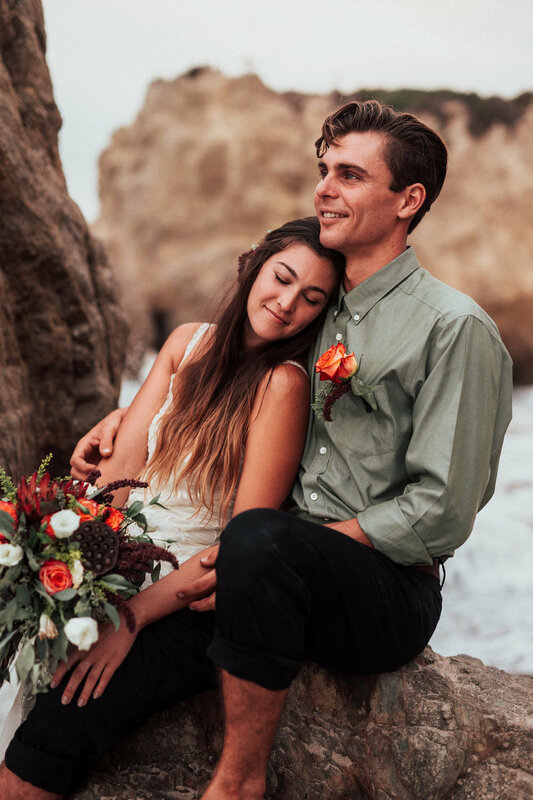 Sammy ("Groom") grew up on the Southern California coast, surfing and living by the ocean, so we saw them as a perfect fit for a beach elopement setting. 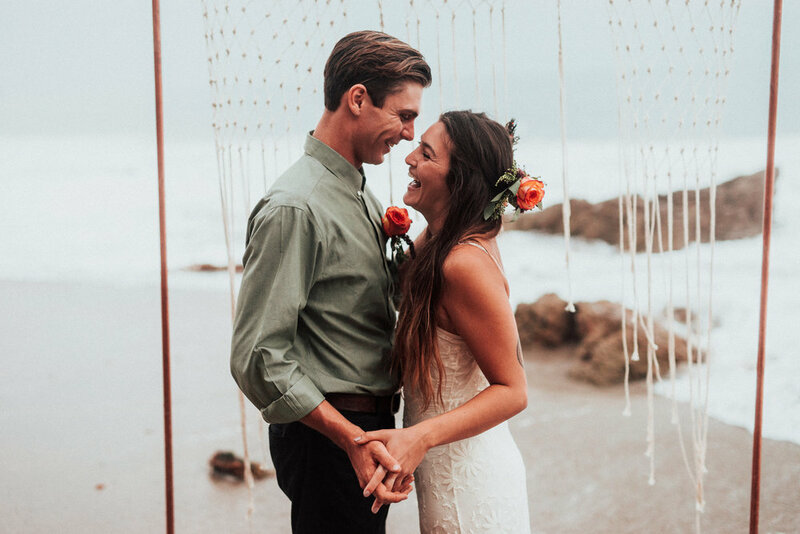 We went for simple, yet elegant, bright and colorful, and something casual, but extremely romantic; which we found at this beach location in Malibu, CA. Behind-the-scenes: There were two main segments to this shoot — a backyard reception and a beach ceremony. 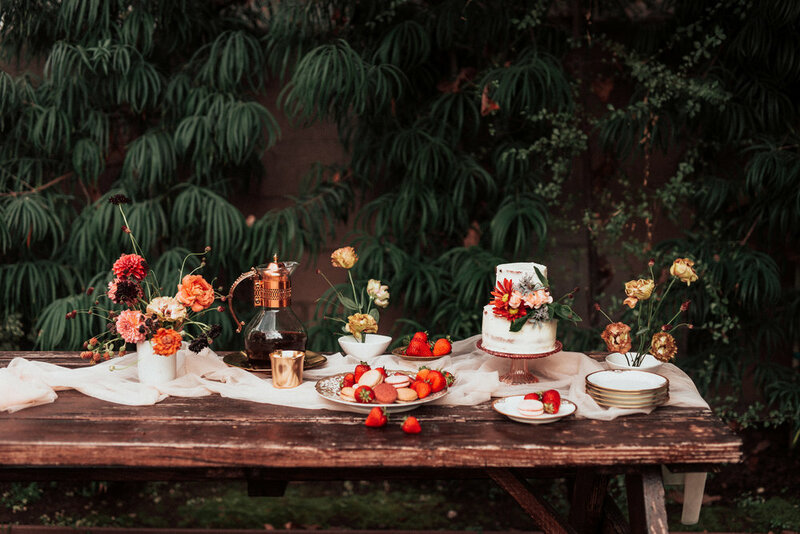 This was our very first styled shoot as Wilder Events Co. and we wanted something light, authentic, warm, and beautiful. 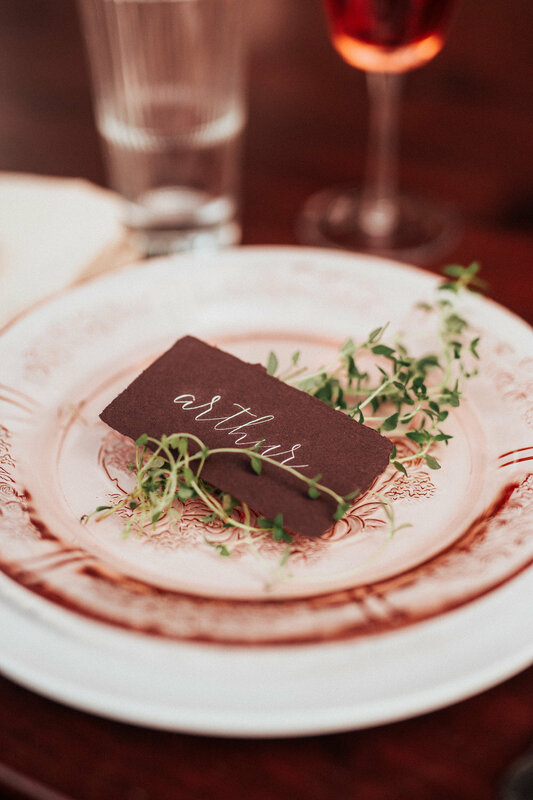 We were so extremely lucky to collaborate with Seth of Seth & Kaiti Photography who just makes magic whenever he's behind the camera lens. We began with the backyard reception, where everything just happened so fast, we all of a sudden found ourselves running out of the house, into our cars to go set-up down the road at our potential beach shot for the second half of the shoot. While half of us stayed at the house to finish the reception segment, the other half found ourselves piling the car with flowers, the archway, decor, rugs, calligraphy, and more. Since it was our first shoot, we weren't sure exactly how many props we should have, so we grabbed everything we thought would work from our houses and thrift stores. Little did we know, we would only use about 30% of props we actually brought. As we're rushing out of the house and onto the Los Angeles highways, we remember that, oh yeah... we're driving in Los Angeles traffic. L: "There was a moment in the car, sitting behind a huge line of traffic with no way to turn around, where I thought, 'well, we're losing light, trapped on the road, we're never gonna get there'. We were frantically texting one another seeing if there was another beach closer we could go to." But, as life likes to have it, we made it on time during the perfect golden hour. The first car arrived unpacking all of the shoot props while one of us watched the car (there were no parking spots), and two of us trekked down the hillside onto the crowded beach, trying to find a less-crowded nook to shoot in. We were surrounded by large families, other couples, and funnily enough, other photographers shooting brides and lovebirds (our bride passed at least two other brides). It took about 3 trips of carrying, not so gracefully, all of our items, maneuvering around the crowded beach, and finally settling down somewhere when the second car arrived. Our photographer was in the second car and instantly started shooting the couple while the three of us (Wilder gals) started building the arch, laying down rugs, candles, and pitchers. S: "While we were setting up we all got splashed by waves multiple times, forgetting that high tide was coming in. At one point I had to scramble up the rock wall to reach the top of the archway in order to attach the greenery and flowers! Not a great day to wear a dress... Definitely ended up with a couple of scratched and bruises. But it was worth it! The set turned out GREAT." Things we learned from our first shoot: Being our first shoot, we learned an incredible amount. Here are some highlights of what we will now forever know! 1) Stick to the timeline you originally created! If you said the shoot starts at 3, start shooting no later than 3:15, because you picked that time for a reason (usually having to do with daylight)! That also means you should have everything on set ready to go by that time so the photographer can begin when they arrive. As the coordinator, be there before everyone else so you can gain your bearings. 2) Don't forget to include travel time in your timeline if the shoot is occurring in two locations. 3) Allowing vendors the freedom to participate in all aspects gives the shoot more personality and uniqueness, instead of completely planning the set beforehand. Always leave room for change and new creativity! 4) Shoot days are long, and that means tummies are going to be grumbling by the end. Provide food or make plans to eat after! 5) Know the exact locations you are going to shoot in. That will save so much time and therefore more light to work with. 6) Simplicity is often key. Sets don't need to be overcomplicated. Allow key items to stand out, like flowers! 7) Have one person in charge of precious items, ie. the wedding bands, who will watch out for them the entire shoot. 8) Consider how you're going to transport and carry props. Don't make the mistake we did and have everything loose in the car! That means armfuls of props toppling on one another, making it very difficult to carry to your site. 9) If you're going to work at/ in the ocean and beach, bring towels for afterwards, and expect a lot of sand in your car!! 10) Alcohol loosens people up. If you're working with people who have never modeled before or aren't comfortable behind the camera, bring booze! See a full list of the vendors we worked with here. Check out more photos in our portfolio!